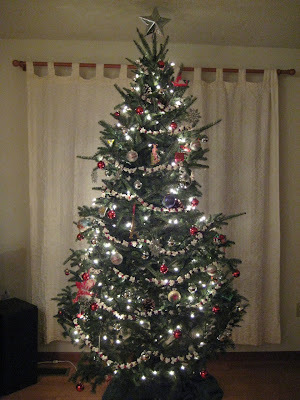 Can the internet handle one more picture of the Ragfield Christmas tree? Rob and I were at Target the other night, and as we walked past the aisles of Christmas decorations, this beautiful silver star caught my eye. It was only $9.99, which I considered totally worth it. For years I’ve been looking for something like this, but I’ve never found any that I liked enough to buy. Now that it’s on the tree, I’m not sure if it makes the tree more or less folksy than the red and gold bow that was there before. Either way, I like it. Thanks to everybody who has called, emailed, etc to ask about my grandma and wish her well. It really means the world to me, to know that there are so many people out there rooting for her. Some have asked if there is anything they can do to help, and I’d say, just keep Grandma (and my mom and aunt too) in your thoughts. All that love and energy really does help, I can feel it. Thanks again so, so much. 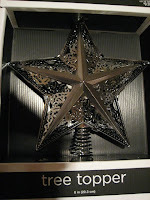 LOVE THE STAR ... great picture ... thanks for posting ... i was going to look for one for you! Hey that is the exact same star we have, and when I say exact, I mean I am going to go home to make sure you did not steal ours.